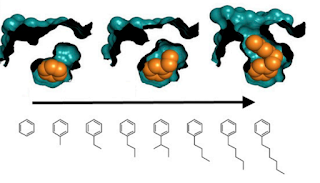 Here’s a paper from the Shoichet lab at UCSF that illustrates one of the major problems that drug designers encounter – predicting conformational changes (“entropy” to a physicist). What the study does is to plug a series of eight very simple congeneric ligands – benzene, methyl, ethyl and propyl benzene all the way to hexyl benzene - into a model protein cavity, in this case a lysozyme mutant, and observe the corresponding changes in protein conformation by solving the crystal structures. And the results aren’t exactly heartwarming for early phase drug discovery scientists. Synthesizing congeneric series of ligands is a standard process in lead optimization and the elephant in the room which is often banished out of sight by drug designers is the possibility of large conformational changes in the protein caused by small changes in ligand structure (the other assumption is constancy in ligand binding orientation, and even that doesn’t always hold). The assumption is that any minor change in structure in the ligand would be accommodated by equivalent, small amino acid side chain movements in the protein. This study shows that at best that assumption is a faith-based assumption which should always be considered provisional. What the authors observe is that instead of a smooth transition of amino acid side chain movements, you see a discrete and far more significant change in protein backbone movement, resulting in a subtle population of different states which bind the ligands. The difference in binding energy going from benzene to hexyl benzene is not too large – about 1.5 kcal/mol – but you are already seeing backbone movements. What is perhaps a bit more reassuring than this observation is that some of the discrete states are mirrored in lysozyme structures found in the PDB - but the authors looked at 121 structures to substantiate the result. Not the kind of numbers you would expect to find in the PDB for your typical novel drug discovery target. The conclusions of the paper are a bit discomforting for at least two reasons. Firstly as mentioned above, drug designers often assume constancy or smooth and minor side chain changes in protein conformation when testing congeneric ligands in lead optimization. It’s quite clear that this is always a bit of a gamble: if something as simple as a change in molecular weight could lead to such divergent changes, what would small but important changes or reversals in polarity do? And then one also starts wondering how much weird or divergent SAR could potentially be explained by such unexpected backbone conformational changes. Secondly, these kinds of changes pose a real problem for molecular modelers. As the paper says, you would need to go to pretty long MD (molecular dynamics) simulations or more radical protein modeling to look at backbone changes; even today, modeling backbone changes by either physics-based methods (like MD) or knowledge-based techniques (like Rosetta) is both less validated and more computationally expensive. Lastly though, this study is another example of why drug discovery is hard even at a basic scientific level. Countless factors thwart the best intentions of drug designers at every stage, and uncertainty in predicting protein backbone conformational changes must rank pretty high on that list.